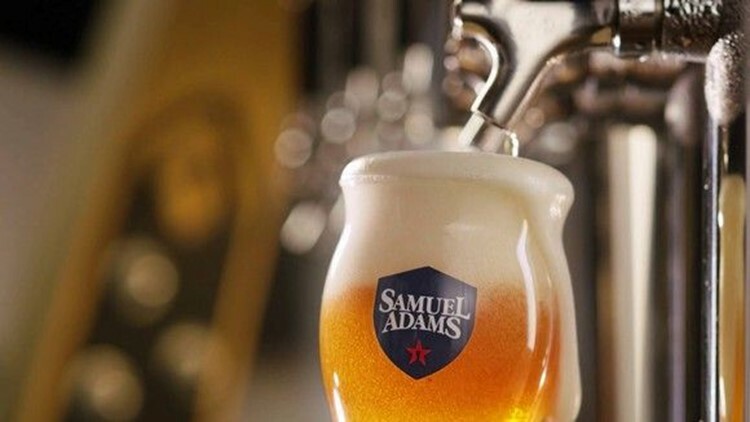 Boston Beer's Samuel Adams sales have been anything but frothy. Let's raise a pint of beer — a free one — for dads Sunday. Cashback and mobile shopping app Ibotta is honoring dads with its second annual “Hops for Pops” free beer rebate. And that's only the start of a long list of freebies and deals for dads this Father's Day. As for Ibotta, dads can collect when they order a beer at any bar and restaurant nationwide Sunday, earning back $5 through the smartphone program. “This Father’s Day, we want to let dads know that their efforts don’t go unnoticed," said Bryan Leach, CEO of Ibotta, in a statement. "That’s why we’re raising a glass to all the amazing dads and father figures out there to remind them how meaningful they are to us." To cash in on the 24-hour offer, download the Ibotta app, select the “Hops for Pops” rebate under the "Restaurants and Bars" category and then order a brew Sunday. After the purchase, upload an itemized receipt in the app to get $5 cash back added to your account. It gets even better if you’re new to Ibotta. For downloading the app and then redeeming your first rebate, you'll get a $10 bonus on top of the $5 beer rebate or $15 back for a single pint of beer. Once you earn $20 in cashback through the app, you can transfer money to a PayPal or Venmo account or choose a gift card. Ibotta also has cashback offers on groceries, household items, Uber rides and online shopping. To help families celebrate dad and save a little money, several restaurants are offering free treats and discounts. Sunday also is the last day to take advantage of many gift card promotions at restaurants nationwide, which can make for a good last-minute gift. Auntie Anne's: Through Monday, buy a classic pretzel and get one free with a coupon. The coupon also includes a buy-one-get-one free deal at Cinnabon. Another Broken Egg Cafe: On Saturday and Sunday, dads get a $10 Brunch Buck to redeem Monday through July 15. Arooga’s: Dads eat free with a purchase of another meal. Dine-in only and limit one discount per check. Baskin-Robbins: With the Baskin-Robbins mobile app, find a coupon for $3 off any cake valued at $15 or more. Beef ‘O’ Brady’s: Dads get a free meal with purchase of another entrée up to $10 value. Ben’s Deli: Buy one sandwich or entrée at regular price in Ben’s dining room Sunday and dad gets his sandwich or entrée of equal or lesser value for 50% off with this coupon. Bertucci’s: Go to www.bertuccis.com/bertuccisfathers and write how dad or the "father-figure in your life" inspires you, upload his photo to the Bertucci's Father's Gallery and get a certificate for a free handcrafted small pizza with purchase of one entrée. The certificates will be emailed on July 1 and can be redeemed dine-in only after 4 p.m. through Aug. 1. Bill Miller Bar-B-Q: On Sunday, buy one combo and get a free buckeroo kids meal. BJ's Restaurant & Brewhouse: On Saturday and Sunday, dads get a free pint glass while supplies last. Boston Market: Get a whole rotisserie chicken, half-rack of ribs, four sides and four pieces cornbread for $29.99 Sunday. Boston’s Restaurant & Sports Bar: Through Sunday, ribs are $15.99. Brann's Steakhouse & Grille: Dads get a free 8-ounce sirloin steak Sunday with the purchase of another entrée of equal or greater value with a coupon posted on the Michigan chain’s Facebook page. Bruegger's Bagels: Get a buy-one-get-one free sandwich coupon Sunday by signing up at www.brueggers.com. Brunch: Not a deal, but Father's Day brunch will be served at restaurants like Bonefish Grill, Metro Diner, Marie Callender’s and regular breakfast spots. Some restaurants have extended hours. Buffalo Wings & Rings: The chain has a buy-one-get-one free meal special Sunday. Bulla Gastrobar: The restaurant is challenging all dads to a Bulla Brainteaser for a chance to win free churros Sunday. Carolina Ale House‏: Dads get a free burger Sunday at participating locations with a minimum $10 purchase. Dine-in only. Carrows: Friday through Sunday, dads who dine in will get a free scratch-off ticket. Prizes include various meal discounts, a whole pie and a 55-inch HDTV. Carvel: Through Sunday, get $3 off a cake with a printable coupon at participating Carvel locations. Excludes small square cake. Cinnabon: Through Monday, buy one classic roll and get one free at participating mall locations with this coupon. Cicis: With a coupon Sunday, get a free kids buffet with purchase of an adult buffet and drink Sunday. Cold Beers & Cheeseburgers: Dads eat free Sunday at participating locations. The Counter: Bring your dad in Sunday and mention BFD (Burger For Dad) to receive a free burger with purchase of an entrée of equal or greater value. Doc B’s Fresh Kitchen: Dads get $4 beers from 4 to 6 p.m. Sunday. Duffy's Sports Grill: Dads get a free pint of beer with any meal purchase and a $10 MVP bonus added to their loyalty account. Join the program at www.duffysmvp.com. East Coast Wings + Grill: Dads that dine at the chain Sunday can enter a drawing for free wings for a year. Each location will draw a winner who will be contacted Monday. Einstein Bros. Bagels: Rewards members have a buy-one-get-one free egg sandwich coupon loaded to their account to redeem through Sunday. Enter your phone number or show a barcode in the email. Sign up for future offers at www.einsteinbros.com. El Fenix: Dads get a free appetizer up to $6.99 Sunday. Fired Pie: With the purchase of an entrée, dads get a free meal Sunday. 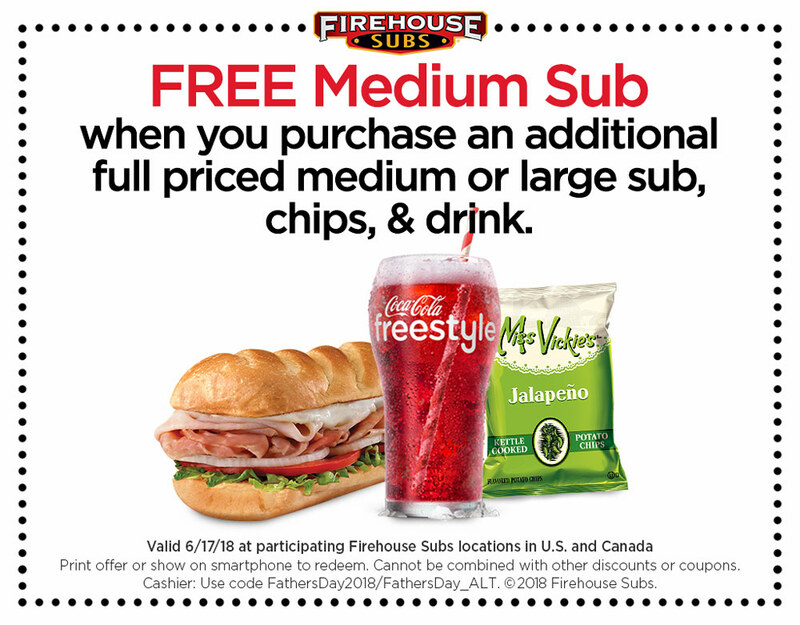 Firehouse Subs: With a coupon, dads get a free medium sub with purchase of a full-priced medium or large sub, plus chips and a drink. First Watch: Dads get a free small bag of premium coffee with their meals while supplies last. Fogo de Chão: Dads who dine in Sunday get a card for a free Full Churrasco lunch, dinner or Sunday brunch, redeemable June 18 through Aug. 30. While supplies last. Glory Days Grill: Dads who dine in Sunday get a bonus card for $10 off their next visit. Card to be redeemed Monday through July 27. Hooters: Dads get 10 free boneless wings with the purchase of a beverage and any 10 wings. HopCat: Dads get free Pretzel Nuggz Sunday. Houlihan’s: Get $5 beer pitchers of domestics and there will be a $19 special menu Sunday. Hurricane Grill & Wings: With purchase of another meal of equal or greater value, dads eat free Sunday. Kings Dining & Entertainment: The entertainment centers will have free pin painting for kids Sunday. LaMar's Donuts: Dads get a free doughnut and a free small coffee Sunday. Lazy Dog Restaurant and Bar: Dads who dine in Sunday will get free limited edition pint glasses while supplies last. 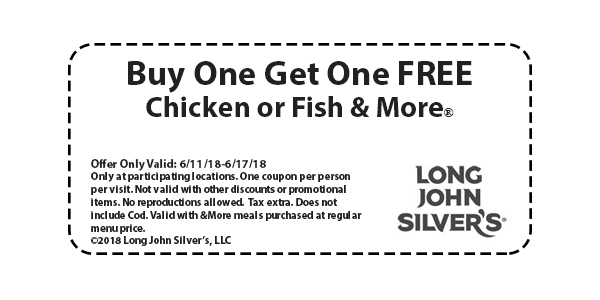 Long John Silver’s: Buy one Chicken or Fish & More meal and get another one free Sunday with this coupon at participating locations. Macaroni Grill: Dads get a $10 off coupon for their next visit to redeem June 18 through July 15. All locations open early at 9 a.m. Sunday and will have a special Father’s Day brunch menu until 4 p.m. and a prix fixe menu all day. Medieval Times Dinner & Tournament: Through Sunday, dad’s admission is free with the purchase of a full-paid adult admission using the promo code DAD18. For a $25 upgrade, dad will receive a souvenir glass stein filled with beer or soda and a framed photo. MidiCi The Neapolitan Pizza Company: At some locations, dads get a free pizza with another pizza purchase. Other locations are treating dad to a free Nutella and Berry Calzone with any pizza purchase. Dine-in offers vary and only available at participating locations. Mimi's Café: Dads get a buy-one-get-one free coupon that can be redeemed June through July 7. MOD Pizza: Show a social media post Sunday and dad gets a free MOD-size pizza or salad with purchase of a MOD-size pizza or salad. Mr. Gatti’s: Dads get a free buffet with the purchase of a kids buffet and two drinks Friday through Sunday. Neighborhood Grills: Dads dining in Sunday will get a $10 certificate valid on their next visit. Oggi's Sports Brewhouse Pizza: Dads get a free pint glass when they order an Oggi’s beer through Sunday. Orange Leaf Yogurt: With a coupon, dads get free frozen yogurt at some locations and $3 off at "Weigh and Pay" locations. PDQ: Dads get a free meal with the purchase of any meal, bowl or salad Sunday. Penn Station East Coast Subs: With a coupon Sunday, get a free six-inch with the purchase of any sub of equal or greater value. Pilot Flying J: For Father's Day weekend, dads get a free cup of Pilot Coffee with an offer on the myPilot app, available to download at www.pilotflyingj.com/mypilot. Pizza Inn: With a coupon available only for rewards members, dads get a free adult buffet with the purchase of an adult buffet Sunday. One coupon per party, per rewards member. Portillo's: With an entrée purchase, dads get a free dessert. Potbelly Sandwich Shop: Dads get a free cookie for stopping in Saturday or Sunday at participating locations. No purchase is necessary. Dads eat free this Sunday, June 17th, at all PDQ locations. Primanti Bros.: Starting at 11 a.m. Sunday, dads get a free classic sandwich when someone at the table makes a purchase of at least $3.99. Recovery Sports Grill: Dads get $3 off any burger Sunday at all locations. Rock Bottom Restaurant & Brewery: The company's suburban locations have a buy-one-get-one free special Saturday and Sunday and the urban locations have a steak and two beers for $25. Roy Rogers: Participating locations will have a bulk chicken special. For $29.99 get 16 pieces of chicken, eight biscuits and three large sides. Rubio's Coastal Grill: Dads can eat free with a buy-one-get-one free coupon Sunday. Ruth’s Chris Steak House: Dads get a free $25 dining card Saturday and Sunday that can be redeemed Monday through Aug. 31 at participating locations. Some exclusions apply. Smashburger: To get a buy-one-get-one deal Sunday, follow Smashburger on Snapchat or Instagram or join the Smashclub at www.smashburger.com. Snuffer’s: Buy one sandwich or burger, get one free with purchase of two drinks. Sonny’s BBQ: Dads get all-you-can-eat baby back ribs for $18.99 Sunday. Spaghetti Warehouse: Dads get a free 15-layer lasagne or any original recipe spaghetti free Sunday. Dine-in only. Stevi B's Pizza Buffet: Dads get a free buffet with unlimited pizza, pasta and salad Sunday at participating locations. Taco Bueno: For a limited time, the original Wholotta Box is $10 and includes 12 Party Tacos or 12 Party Burritos or six of each, two sides of refried beans, two sides of Mexican rice, four bags of tortilla chips, and one large side of Original Red Salsa. TCBY: Dads get their first six ounces of frozen yogurt free at participating locations nationwide Sunday. Teriyaki Madness: If you’re signed up for email or texts, you’ll get a coupon for a free bowl when you buy one bowl and two drinks. For future offers, join the Club Mad at www.teriyakimadness.com/clubmad. Texas de Brazil Steakhouse: Dads dining in Sunday will get a free $20 certificate to redeem June 18 through Aug. 31. The certificate is for $20 off two dinners and can only be used Monday through Thursday. Other exclusions apply. Texas Steakhouse & Saloon: Dads dining in Sunday get a coupon for a free entrée to use on their next visit. TGI Fridays: Customers placing their first online orders Sunday will automatically get 20% off. Prices and participation apply. Tijuana Flats: Dads get a free upgrade to a double-meat, double-cheese "Megajuana" meal and a free beer Sunday. Excludes fish. TooJay’s: Through Sunday, take $5 off a $20 purchase with a coupon. Toppers Pizza: Get a free Baked Mac 'N Cheese with the purchase of any large pizza at regular price Sunday. Twin Peaks: Dads who dine at the chain Sunday get a "Dad Pass" buy-one-get-one free coupon to redeem on their next visit. UFC Gym: Friday through Sunday, UFC Gym signature locations across the country are offering free workouts for dads and their families. White Castle: Email subscribers will get a buy-one-get-one coupon for breakfast combos. Sign up for future offers www.whitecastle.com. Wienerschnizel: Dads get a free sundae Sunday. To redeem the one-day offer, fathers should show proof of “dad-ship” by bringing in their children, showing a family photo or telling Wienerschnitzel employees a fun story about their kids. WingHouse: All-you-can-eat wings are $15.99 Sunday. Dine-in only. Wing Zone: Friday through Sunday, get 20 original wings and two ranch dressings for $19.99 with code 2121. Zea Rotisserie & Grill: Dads get a free 4-pack of Abita Beer with a minimum purchase of two entrées while supplies last. Zinburger Wine & Burger: Dads get a free large salad or entrée sandwich with the purchase of an entrée of equal or lesser value. Dine-in only. Local deals: Locally-owned businesses and smaller chains also may have deals Sunday. One of the easiest ways to find out is to check social media channels or call your favorite restaurant. Special menus: Restaurants including California Pizza Kitchen, Tony Roma's, Fleming’s Prime Steakhouse, Logan's Roadhouse, Morton's, Shoney's, Ninety Nine Restaurant & Pub, Maggiano's, Melting Pot and several more will have special menus Sunday and some will have extended hours. Kelly Tyko is a consumer columnist and retail reporter for Treasure Coast Newspapers and TCPalm.com, part of the USA TODAY NETWORK. This column reflects her opinion. Read her Bargainista tips at TCPalm.com/Bargainista and follow her on Twitter Twitter@KellyTyko. Sign up for her weekly newsletter at www.tcpalm.com/featured-newsletter/bargainistabest.